The annual Lyrid meteor shower peaks this coming Monday, April 22. The Lyrid shower looks like it comes from Vega in the Lyra constellation. Vega is a bright star, 3 times larger than our sun, and 25 light years from earth. Lyrids are actually a dust trail from Comet Thatcher – officially known as C/1861 G1. Space dust, typically the size of a grain of sand, hits our atmosphere at 110,000 mph. The Lyrids aren’t known for large numbers of meteors per hour – usually 10 – 20, with peaks that may produce up to 100. “Lyrid fireballs” is the name given to outbursts of brighter meteors that leave a smoky trail behind for a minute or two. 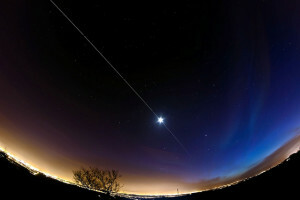 The best time to ponder Lyrids is in the hour or two before sunrise on April 22. Get yourself away from city lights – bundle up; as you lay on your back facing east. An extra bonus for people in the Northern Hemisphere – sunspots AR1726 and 1727 are getting uppity.Any eruptions this weekend would be earth directed meaning geomagnetic storms could bring some strong auroras.